One more recipe from simplifysuppers.com : Chicken Orzo Salad. I made this for a work function and realized while making it that one of the ingredients was missing from the list. That’s the second recipe from ss that I’ve come upon like that. After I got to work and shared the dish, and the missing ingredient issue, we collectively agreed that it must have been sliced almonds that was missing. If I made it again, I’d get larger grapes and the larger orzo pasta. It was a little gummy but very tasty. It would have been even better with the almonds! She wore it the Sunday after Christmas and that was ok. It’s called “Silent Mice” and is the sweetest little plate I’ve seen for Christmas. I learned a lot of things on that dress. 1. Everything takes longer than you think it will – especially hemming a dress. 2. Never ever take that top holding row thread out until you’ve completed the finishing. 3. Finishing isn’t near as intimidating as I thought. 4. A French seam is your friend. 5. No one, and I mean no one will know if your stitching is exactly right – on the smocking or the finishing. 6. There’s a sense of accomplishment in sewing that nothing else brings. I created not only a beautify heirloom, but I created a necessity – clothing! 7. I’m glad I’m finally learning this craft that my Mother’s does so well. It gives me a respect and appreciation for her that I’ve never known. And I’m glad I learned it while she can encourage me and see the outcome! And a favorite during the holidays….You Got I! Hot Hot Hot YOU GOT IT! Hot Chocolate! N Elmo (Nemo) has now turned into Meeemo. Singing: ABC song, Twinkle Twinkle, Itsy Bitsy Spider, and most recently Jesus Loves Me. She bows her head and folds her hands for prayers. I’ll hear her from the other room talking to her babies, to Fro Whi, to her kitchen. She loves to play dress up and color and show Mama and Daddy. That’s all for now. Happy Monday. 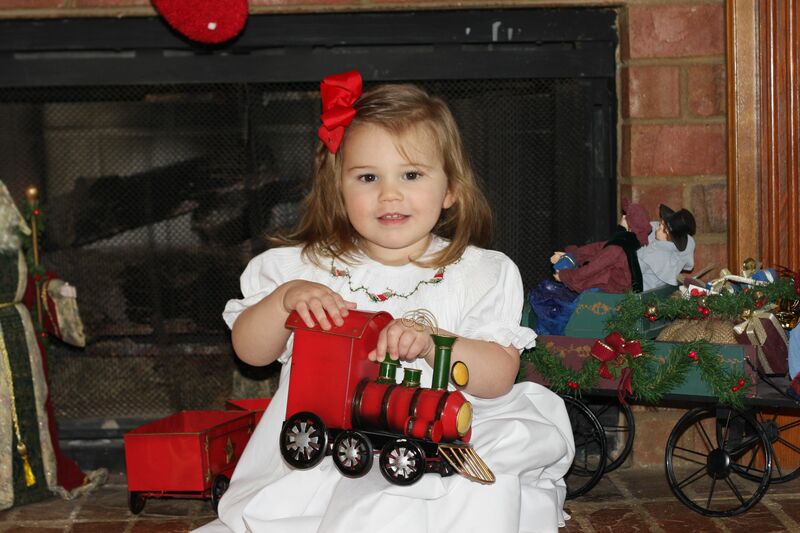 Garner is so pretty in that dress and so grown up! The dress turned out great! 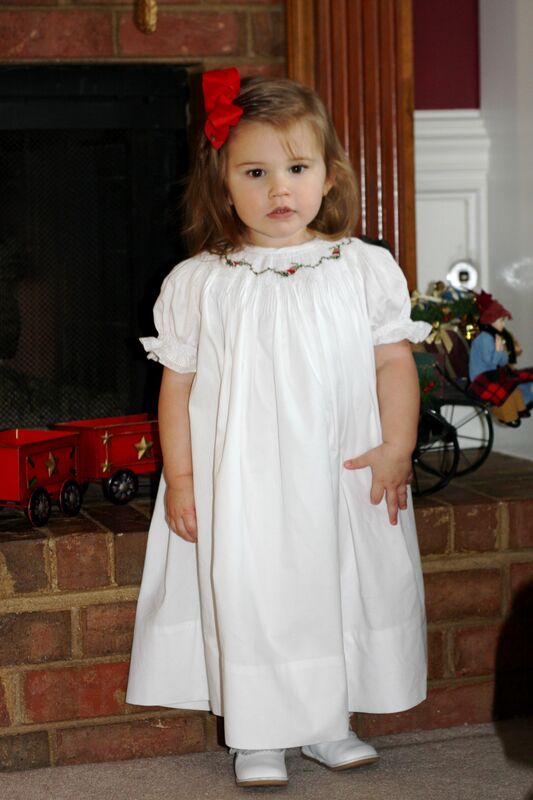 Love Garner’s dress! You did such a great job! She is the cutest! I still need to try simplify suppers. Hope you have a great week! The dress was so pretty on the hanger, but so so beautiful on Garner. She looks so precious. Wish I could kiss her, kiss her. And, once again I am so proud of your newest accomplishment in the needle arts.